‘Fruit large, of an oblong, and somewhat irregular figure, having some slightly obtuse angles, which, more or less, extend from the stalk to the crown; generally about three inches and a half long, and three inches broad. Eye small, deeply sunk in a very angular basin. Stalk short, inserted in a rather deep angular cavity. Skin a little scabrous, yellowish green on the shaded side, but of a brown or purplish colour when fully exposed to the sun and highly ripened. Flesh melting, and full of a sugary and highly perfumed juice. In eating from November till January or February. It succeeds on both the Pear and the Quince.’ [George Lindley – Orchard Guide p.395/1831]. ‘Merlet writing in his L'Abrege des bon fruits of 1675 said that the Chaumontel pear originated from a wilding growing at Chaumontel, Fr. In 1765 Duhamel du Monceau saw the parent tree, at that time more than a century old, bearing a fine crop.’ [Pears of New York p.335]. It was discovered in 1665 at the Chateau Chaumontel near Chantilly and was much in vogue at the time of Louis XV in France. The original tree died in the hard winter of 1789. [HP pl.XXXVIII/1878]. ‘A dessert pear of the highest merit. (But) some think the flavour of the Winter Nellis superior to the Chaumontel, and it is certainly more hardy and prolific.’ [Gard. Chron 1860]. Figured in the Herefordshire Pomona [HP pl.XXXVIII/1878], Jardin Fruitier du Muséum [JFM vol.3/1860] and Pomona Britannica [PB pl.LXXX/1812]. ‘First size; first quality; form oblong; melting. In use from March to May.’ [NHM vol.1 p80/1864]. 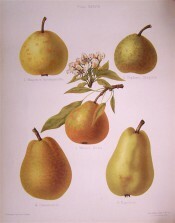 Listed in all published catalogues as ‘Chaumontelle’ [Pear no.2/1843]. ‘2. April-June. Great bearer generally on alternate years. When in perfection of excellent quality, melting sweet and juicy with high aroma.’ [Diary B, MP A2951/1862].